With our annual holiday season now at an end, it is probably an opportune time to reflect. 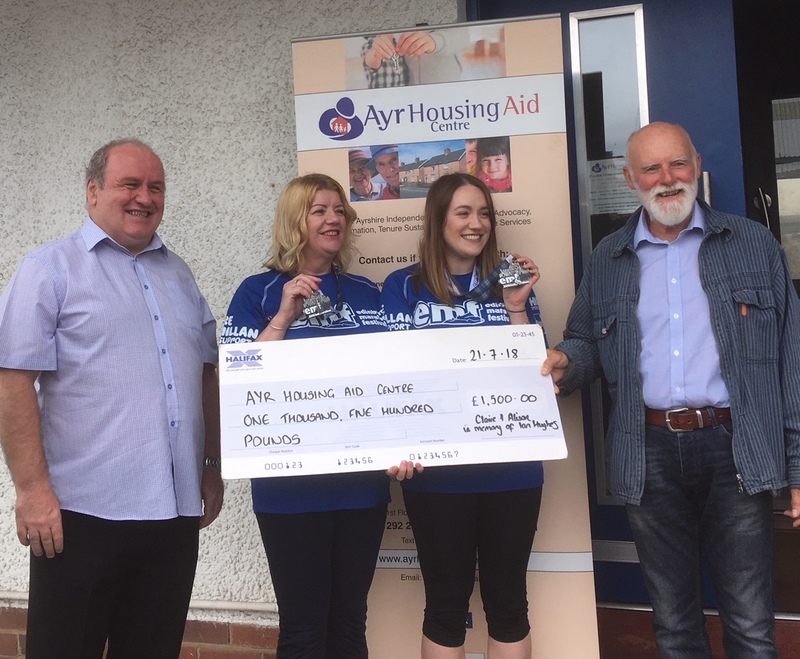 Ayr Housing Aid Centre a Free Independent Organisation provides a range of services and has been in existence for over 30 years. We were initially established by interested parties and individuals within South Ayrshire due to concerns around homelessness and its impact on individuals and their families. Over these 30 years we have opened over 23,000 cases which have impacted on over 100,000 people when taking into account families. On average about 50% of or cases related to homeless or threatened with homelessness. We welcome the fact that profile of the plight of the homeless is raised around Christmas period although homelessness is happening all year round. As we see homeless growing again it highlights that we should not be complacent. They are many causes of homelessness and indeed often decisions made on others areas of policy such as welfare reform can directly lead to homelessness. It is sad that we see the growth of poverty including child poverty in the 21st Century which also contributes to homelessness. The Centre is committed to providing services and to prevent homeless where possible. We at the Centre work with many partners in the fight against homelessness all year round and we thank them for their support. We would take this opportunity to thank the Salvation Army for their wonderful response to ensure that children of families who struggle at Christmas receive gifts; this is supported by donations from the public and businesses. The Centre has been part of this worthwhile response over a number of years and this is an example of strong community partnerships. We acknowledge and thank the many individuals, groups and businesses such as SeAscape, Foodbank, Unity Grill and Wheels in Motion to name a few who supports individuals and organisation such as the Centre to help those in housing need all year round. The Centre held an organised Sponsored Walk where Staff, their families and Organisations participated. £1,371 was raised. A big thanks to everyone who took part in this event. The money will be used to provide free, independent Housing Information, Advice, Advocacy and Engagement Services. The Centre has claimed Gift Aid on relevant donations. This will increase our total fundraising money even further. Claire MacDonald and Alison Brown took part in a Half Marathon in memory of a founding member of the Centre, Ian Hughes and raised a remarkable £1,500 for the Centre. A massive thanks to Claire and Alison. The Centre has claimed Gift Aid on the above which will increase the money raised to a marvelous £1,875. Karen Taylor or Suzanne Moffat at info@ayrhousingaidcentre.com or by phone on 01292 288111. If you wish to make a donation direct to the Centre please contact Karen. At the point of registering we will provide you with a Sponsorship Form, Route and Risk Assessment. There will be Marshalls at different points throughout the walk. It is our aim to raise funds but also we hope all participants will have an enjoyable experience walking with the Centre. 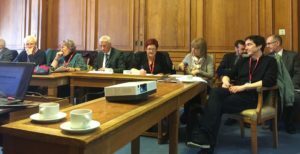 The Centre’s Management Committee and Staff have been working towards the implementation of the new GDPR. There have been extensive reviews of personal data the Centre holds, amendments to current Policies and Procedures and new Policies and Procedures created. The Centre has contacted all current Service Users prior to 25th May 2018 advising of the new Regulations and where further information can be sourced. We have amended our Confidentiality Forms to take into account the new Regulations which will become effective for new Service Users on or after 25th May 2018. The primary aim of the new Regulations is to protect personal data which is provided by Service Users, Staff, Management Committee and Volunteers, this includes the processing of the data, retention and destruction. John Mulholland, CEO said “The Centre is committed to the protection of personal data we hold and the need for confidentiality. We have created a tab on our web page for Service Users which provides more detailed information relating to the relevant Policies and Procedures, in particular, the Privacy Notice for Service Users”. Ayr Housing Aid Centre held its AGM on Thursday 15th March 2018. The AGM was well attended and detailed Reports were presented by the Chairperson, Treasurer and Chief Executive Officer. 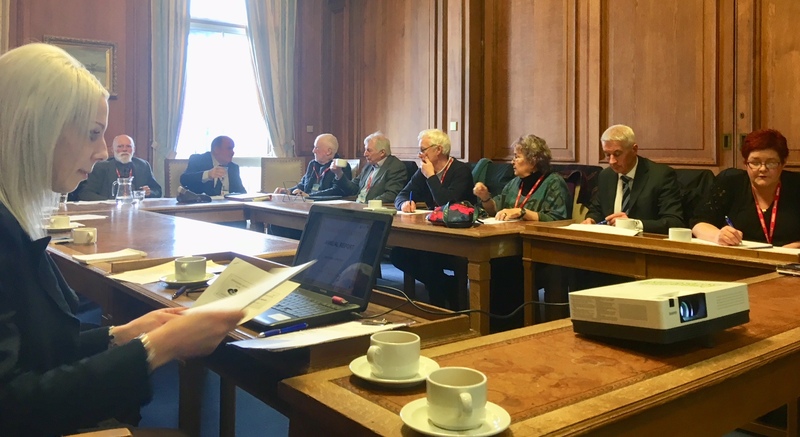 Alex gave and update on the Centre’s plans to convert to a Scottish Charitable Incorporated Organisation (SCIO) which will be taken forward by the New Committee. The new Committee was elected and Alex welcomed the 5 new members to the Committee. Alex Anderson, Chairperson welcomed all to the meeting. Alex refered to the development of our services and staff over the past year. He outlined our preparation for Procurement of the Services provided by the Centre and thanked the staff and Procurement Sub-Committee for their input into the process. He highlighted the external recognition of the quality of Services we provide and linked this directly to our staff. Finally, he thanked the Management Committee for their support over the past year. 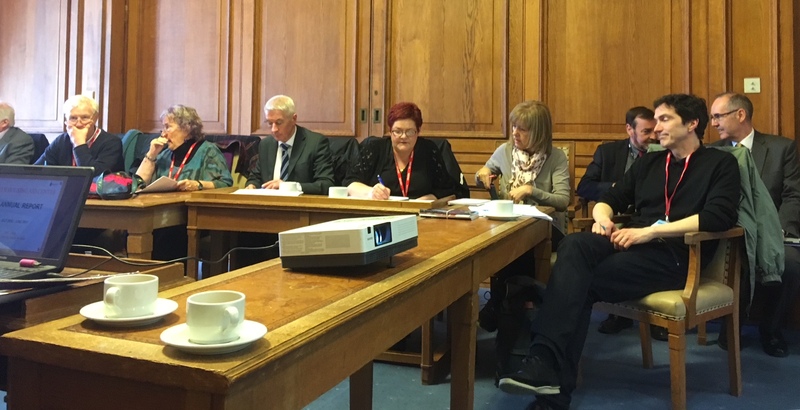 Ethel Riach, Treasurer presented a detailed Report on the Centre’s finances based on our Statement of Financial Activities, submitted to Office of the Scottish Charities Regulator. She advised that the account had a small surplus. She highlighted income and expenditure into the next financial year and projected a small surplus of around £4,000 for 2017/2018. 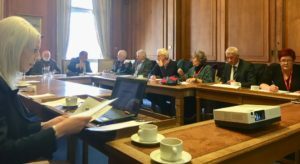 Ethel considers the Centre currently has a strong financial foundation although we continue to review all our income and expenditure commitments. Ethel highlighted the work of our Fundraising Sub-Committee and thanked all who made donations to the Centre throughout the year. Ethel thanked the CEO, Services Manager and Administration Officer for their efficient record keeping, day to day financial control, projections and our Accountant, Andrew Howatt. John Mulholland, CEO presented a detailed Report on the wide range of Services provided by the Centre. 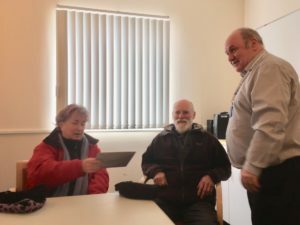 He advised once again it has been a very busy year and commented “the services provided to both individual Service Users and Groups are innovative, preventative, proactive, participatory and inclusive”. John outlined we continue to provide high quality, transparent services to our service users and work together to achieve positive outcomes. He highlighted the importance of partnership development in providing Services further enhanced over the past year. John made specific comments relating to the new contract with South Ayrshire Council and its impact on the services we provide. He outlined the challenges for the year ahead and beyond. Suzanne Slavin, Services Manager presented some statistics from the Annual Report. The Centre opened 1,148 cases between 1st July 2016 and 30th June 2017 including 276 rural cases. 159 Service Users had a physical disability, 280 had a mental disability and there were 220 Service Users with both physical and mental disabilities. 659 (57%) of all cases opened had some sort of disability. 811 Service Users were in the 25 – pension age group, 294 Service Users aged 16 – 24 and 215 cases from the pension age group. 30% of our caseload were vulnerable Service Users through being incapacitated or on ESA, 26% were unemployed and 28% were in work. We have noted a continued increase year on year from those in employment. Many problems relate to poverty caused and impacted on multi-debt issues including housing arrears and budgeting matters. 85 cases were from retired age group, 36 were Students and 31 cases were Carers. 547 cases were homeless or threatened with homelessness. Out of these cases we had the opportunity to prevent homeless in 321. From these 321 we prevented homelessness in 268 cases, (83%). Becoming homeless has numerous impacts on families in particular: economic, social, health and educational. Prevention alleviates/reduces many of these issues. John thanked all staff for their commitment and support over the past year. Suzanne Slavin presented Service User Feedback slides and commented “We are very pleased with the positive feedback across all our Services. We will continue to engage with Service Users at all levels to encourage input and service development. I would further thank all Service Users who have taken the time to provide feedback which directly improves the Services we provide every day”. Mark Willis gave a very informative presentation on the work of Child Poverty Action Group. His presentation outlined the impact of Universal Credit nationally and locally. This was followed by a robust question and answer session. Thereafter Alex thanked the Speaker and all who attended our AGM. Our Summary and full Annual Report were added to the Centre’s website from 19th March 2018. If further information is required please contact John Mulholland, CEO or Suzanne Slavin, Services Manager on 01292 288111 or ayr_hac@hotmail.com. 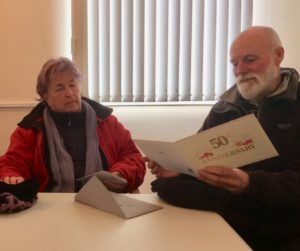 The Centre would like to congratulate Alex (Chairperson) and Les Anderson on their 50th Wedding Anniversary. Alex has been a long standing member of the Management Committee and Chairperson and Les has Volunteered for us over the years. Big thank you to Claire Macdonald and her mum for wanting to raise money for the Centre. Her Uncle Ian Hughes was one of the founders of the Centre and his legacy lives on in what we do each day to help those in housing need. We are hosting our Annual General Meeting on Thursday 15th March 2018 at 2pm within the Ayr Committee Room of the County Buildings, Ayr. Our Guest Speaker Mark Willis from Child Poverty Action Group (CPAG) will talk about the impact of Universal Credit on child poverty after the formal business has been concluded. Summary copies of the Annual Report will be available or can be e-mailed on request. Tea, coffee and biscuits are being provided from 1.30pm.